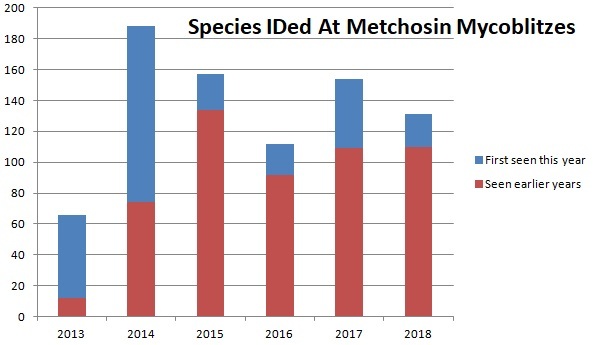 The data generated by the Metchosin BioBlitzes and MycoBlitzes is maintaned in a database. At various places on our site we give you textual views of this data. Pictures, though, can be worth many words. Here are some views of our data that make use of visuals. 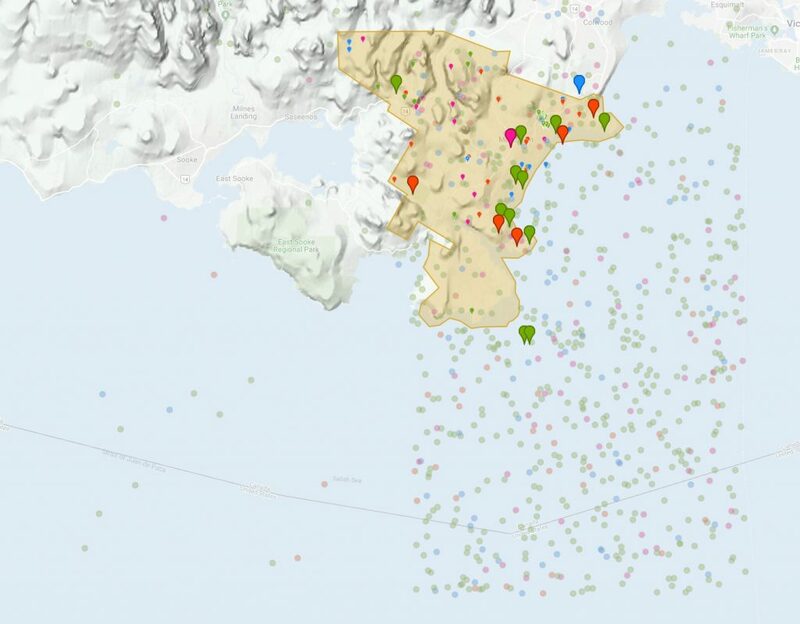 Andrew Simon, curator of the Biodiversity Galiano project, has been working with the UK’s Antranig Basman to develop a visual representation of the Galiano bioblitz results. Antranig is an associate with Raising the Floor initiative. Andrew and Antranig came up with what they call the “bagatelle” or “sunburst” representation of Galiano species. 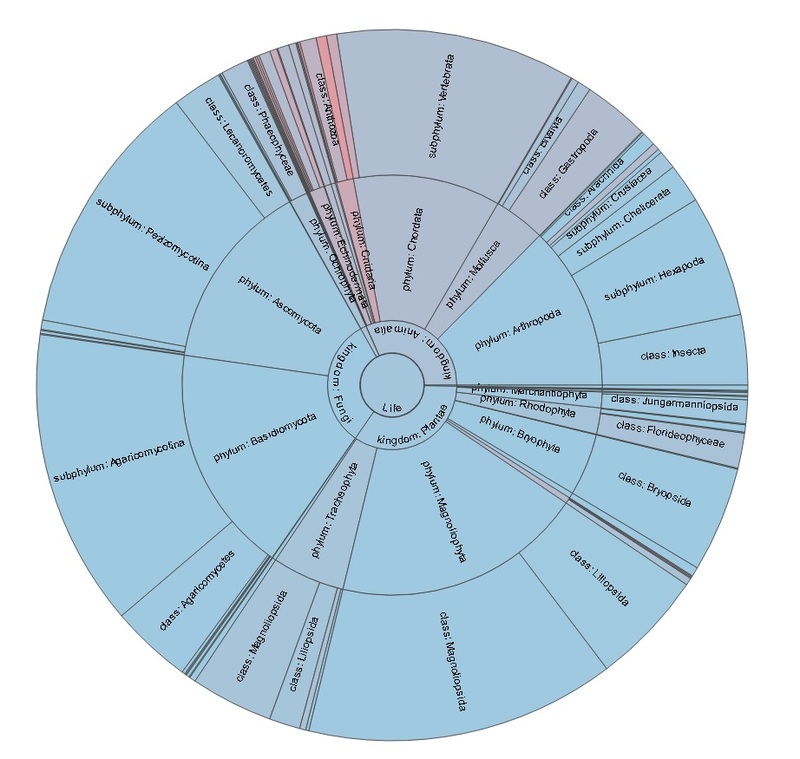 They kindly assisted the Metchosin Biodiversity Project to adapt their own database to this unique visualization. To see how the sunburst for Metchosin species works, click on the image of the sunburst. By starting at the middle of the circle and clicking your way to the outside, you will gradually see more and more restricted taxa of species. At the end of the migration to the periphery of the circle, you will find specific species. Hovering the mouse over these shows a species observation from our database. All observations from our 2011 and later BioBlitzes and MycoBlitzes are represented in blue. Observations from pre-bioblitz lists are in a shade of red. Taxa that contain both types of observations are in a mixed shade that represents the proportion of each type of observation. Currently, about 85% of our BioBlitz and pre-BioBlitz species discoveries are represented in the sunburst. 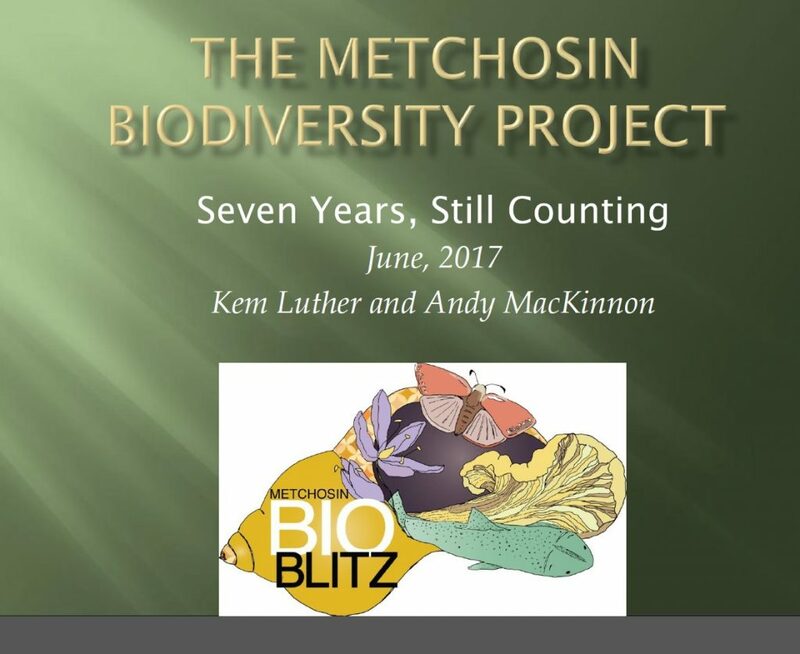 In June of 2017, Andy MacKinnon did a PowerPoint presentation at the annual GOERT colloquium on our Metchosin Bioblitzes. You can view a PDF version of Andy’s talk by clicking on the image of the first page of the talk. Here are two charts that show summaries of our BioBlitz data. At the top is a pie chart of our species group breakdowns as of 2017. Under it is a chart showing the number of new fungal species found each year at our annual MycoBlitzes. In 2019, we uploaded our 12,000+ species observations into iNaturalist, in order to get ready to use iNaturalist to extend our bioblitz sightings. One byproduct of the upload was a map showing the locations of our species observations. You can view this map on our project page. Unfortunately, iNaturalist treats many of our species as species of concern and it “fuzzes” their locations. The observations appear to be in the ocean! © 2019 Metchosin Biodiversity Project. All rights reserved.